It is widely said that life started in the ocean, and gradually moved on to land. In the case of tracked robots this trend is reversed. During the early 2000s, driven by significant defense demands, compact ground robots developed rapidly. Products like the PackBot from iRobot and the Talon from Foster-Miller pioneered man-portable high performance ground robots. The demands of operating in harsh environments made these tools robust and inspired fully waterproof variants. Unfortunately at the time limitations in energy storage, autonomy and telemetry made seafloor crawling robots a novelty rather than a productive tool. This has changed. 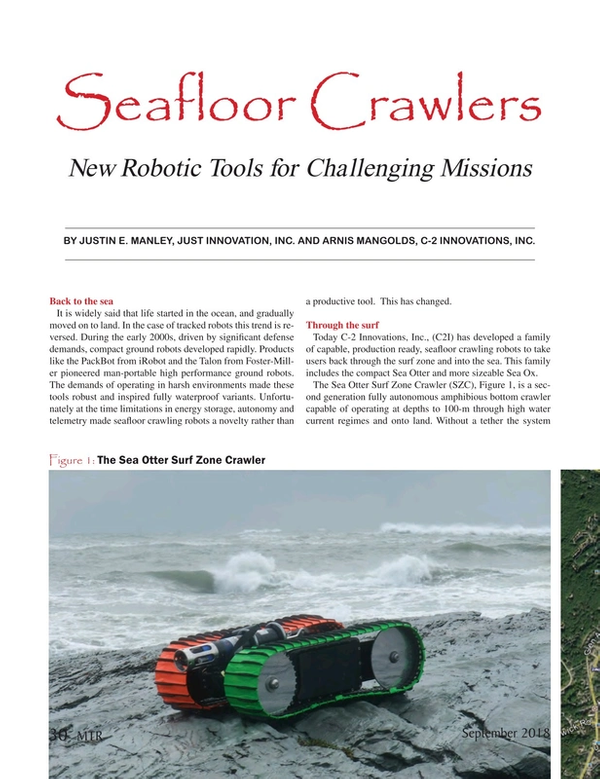 Today C-2 Innovations, Inc., (C2I) has developed a family of capable, production ready, seafloor crawling robots to take users back through the surf zone and into the sea. This family includes the compact Sea Otter and more sizeable Sea Ox. The Sea Otter Surf Zone Crawler (SZC), Figure 1, is a second generation fully autonomous amphibious bottom crawler capable of operating at depths to 100-m through high water current regimes and onto land. Without a tether the system can operate in regions and currents that previous systems could not. The C-2i Otter can drive 16-km underwater or 20-km on land, and station-keep for a month; returning either on command or on a prearranged timeout. The ability to operate in mixed environments is unique, whereas the SZC allows access to areas that surface craft, swimmers or human based techniques could not. The Sea Otter SZC operates with negative buoyancy while operating in the lower energy boundary layer. The low profile further minimizes current drag. The vehicle has operated in 1.5-m plunging surf and can cross soft terrain that will not support human loads. Recent tests demonstrated the ability to carry 40-kg payloads as well as tow a 45-kg sled across various marine surfaces. The Sea Otter design is modular. The starboard and port side pontoons are core pieces, but the length, width and ground clearances can be changed by lengthening the idler sprocket brackets or changing out the connecting bridge. The current design includes two Ethernet guest ports and internal space for additional circuit boards such as data acquisition or video boards. The modular design has permitted strap-on payloads to be mounted within minutes, without concern of payload shape, volume, or weight. Payloads have included salinity, turbidity, sonic velocity depth, various cameras, imaging sonar, release-able buoys, soil penetrometers, and electromagnetic sensor sleds, among others. Batteries and all electronics are included within the track volume maximizing free volume for the payload bay while minimizing “bottoming-out.” The wide track results in ground pressures of less than 1.3-kilopascal, when dry or 0.43 kilopascal when submerged. Track design can be modified for more aggressive grip or made wider and longer to reduce the ground pressure contact. Fenders are added to minimize turbulence and drag. Autonomous navigational accuracy is achieved by fusing data from a single axis fiber-optic gyro (FOG) and a 3-axis inertial measurement unit. A dual-band GPS receives a fix when surfaced and is used as a cross-check on position. Shaft encoders on each drive side measure distance traveled. Accuracies of 2% of total range have routinely been achieved. Turn-in-place (TIP) and arc-turns are calculated to maintain path accuracy. Figure 2 illustrates a preprogrammed ladder search pattern along Wells Beach in York, Maine. Testing occurred while the tide was high and the system was submerged (note the photo is at low tide). In addition to the Sea Otter, a larger variant is available. The Sea Ox is a versatile subsea bottom crawler designed for mapping and sampling the ocean floor. Like the Sea Otter, the modular design permits easy transport, storage, and deployment. The system is designed to operate either autonomously or by tethered or RF command. The Sea Ox is 122 x 122 x 30 cm in standard configuration but can be quickly extended to increase range or towing capacity. As shown in Figure 3, the Sea Ox has a 32 km undersea range, which can be extended by the addition of battery packs to 64-miles. Overall weight of the tractor is 113 kg and can be ballasted to 230kg if operating in high surf. The Sea Ox was originally designed to tow an instrumentation sled that incorporated twin electromagnetic induction (EMI) coils designed by White River Technologies, Inc. The 60 x 180 cm sled weighs 30kg including instrumentation. Without a concern for buoyancy or volume considerations, the Sea Ox and its sled have been used to bolt-on additional customer instrumentation packages such as CTD, dissolved oxygen (DO), sonic loggers, acoustic imagers, and acoustic Doppler current profilers (ADCP). Under development is a multi-shot coring system to bring back physical samples from the seafloor environment. Seafloor crawling robots are not simple novelties; they enable many critical applications. The Sea Ox’s amphibious nature permits operation on land, through and including the transition zone to a depth of 100-m. A low 30-cm profile reduces drag by operating in the lower velocity soil/water boundary layer, and allows it to operate unobtrusively under surface traffic. The wide track creates an extremely low 0.0186 bar ground pressure that can transit extremely soft ground that is an order of magnitude less than humans. With a 16-km underwater range (32+ km surface), it can survey whole beaches in a single day. The modularity of the Sea Ox allows it to be hand carried through sensitive beach areas and can be launched and recovered by a single person from shore; reducing the cost of surveys to a fraction of conventional systems where the logistical costs can out-weigh the actual operation. Some recent applications have demonstrated this potential. In this mission, the Sea Ox towed a White River Technologies, Inc. (WRT) marinized Flex-EM detector array. These were accomplished. The more capable Sea Ox is modular with a single tool assembly and a 25kg max component weight. It can provide up to a full year year of station keeping for multi-location, self-deploying diurnal, and seasonal site characterization. And onward . . .
Seafloor crawlers are an emerging category of undersea robotics. Enabled by improved component technology these tools are now delivering useful performance. For sustained, precise survey through the surf zone there are now viable robotic platforms taking us back to the sea.